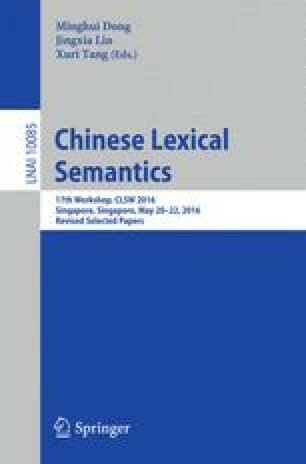 In this paper we propose a novel word representation for Chinese based on a state-of-the-art word embedding approach. Our main contribution is to integrate distributional representations of Chinese characters into the word embedding. Recent related work on European languages has demonstrated that information from inflectional morphology can reduce the problem of sparse data and improve word representations. Chinese has very little inflectional morphology, but there is potential for incorporating character-level information. Chinese characters are drawn from a fixed set – with just under four thousand in common usage – but a major problem with using characters is their ambiguity. In order to address this problem, we disambiguate the characters according to groupings in a semantic hierarchy. Coupling our character embeddings with word embeddings, we observe improved performance on the tasks of finding synonyms and rating word similarity compared to a model using word embeddings alone, especially for low frequency words.